On Monday, three Republican senators unveiled a bill to deal with the DACA mess President Trump dumped in their laps earlier this month. Rather than merely keep his promise to rescind President Barack Obama’s unilateral decision to grant legal status to children who were brought into the United States illegally, Trump gave Congress six months to pass a bill resolving the dilemma of the so-called DREAMers, so named because of the acronym of the original bill that promised them relief. But if they think liberals will accept anything short of the full amnesty for those kids and their families that Obama promised, they’re the ones dreaming. The bill, dubbed the SUCCEED Act, is a slightly less generous version of the original DREAM act. The proposal, which the sponsors say has Trump’s support, would give those who were brought into the country illegally as minors a 15-year path to citizenship after fulfilling a number of requirements including getting a high-school diploma, passing a background check and paying off any back taxes. But like all past efforts to do anything about immigration — including the bipartisan bill put forward by the “gang of eight” in 2013 — this one satisfies few on either side of the political aisle. That’s why it’s another example of how ideological warfare makes it impossible for Congress to act even when most of the members and the majority of the American people agree on something. 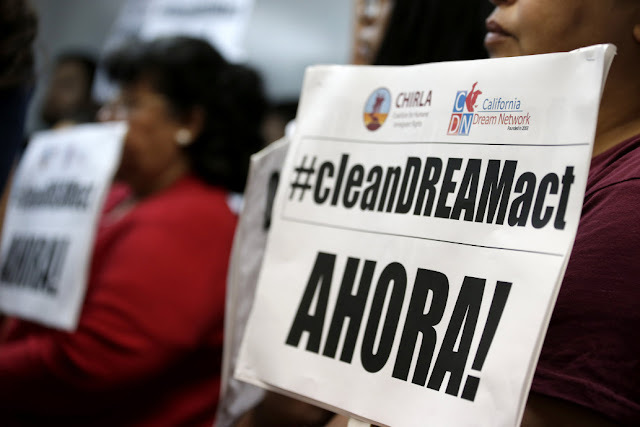 The differences between the new GOP bill and the DREAM act aren’t all that great. The Republican plan requires more effort on the part of those illegal immigrants seeking to get right with the law. It also makes them wait longer to use their new legal status to sponsor other family members — i.e. the people that illegally smuggled them into the country in the first place. That seems in line with a national consensus on the question that views the plight of the DREAMers with considerably more sympathy than that of adults who come here illegally. Since Republicans control both houses of Congress and the White House, those terms ought to be good enough for Democrats and the increasingly noisy lobby that advocates amnesty for all illegal immigrants, whether they came here as kids or not. But they aren’t — and that tells us everything we need to know about American politics in 2017. Rather than seeing Trump’s willingness to abandon part of the hard-line position on illegal immigration that he campaigned on as a chance to advance the cause they claim to support, Democrats seem to believe this is an opportunity to make political hay. Liberals know many congressional Republicans will never vote for anything that grants amnesty to any category of illegal immigrants. That means the SUCCEED bill will need Democratic votes. But it may not get them because it interferes with something liberals care more about than illegal immigrants: the war on Trump. You can put some of the blame for this on a president who thrives on stoking the culture wars, including the current one being waged over NFL players not standing for the national anthem. That means the dynamic of every debate — even one on which majorities in both parties agree, such as the effort to bring children brought here illegally out of the shadows — quickly becomes a zero-sum game in which those backing Trump or refusing to agree to every liberal demand can be demonized as racists. Meanwhile, those on the right who see illegal immigration as the defining issue that Trump rode to victory in November are equally unwilling to budge from their position that sees any compromise as a betrayal. Trump’s shrinking popularity, along with the inability of congressional Republicans to accomplish anything they promised, has stiffened the Democrats’ resolve to refuse to give an inch on this or any other issue. With their eyes firmly fixed on the 2018 midterms, they seem to think they’ll do better by letting Obama’s DACA order sink rather than help Republicans pass a version of it. But if Democrats won’t pass a compromise that helps the DREAMers simply in order to stoke the fires of the anti-Trump “resistance,” then they’ll deserve the lion’s share of the blame for the failure to help a group they claim to care about.